I like to wander. I do some basic research on a location so I know what’s around, grab a map and a camera, and head out. It seems to balance out the detailed planning that goes into holidays and research trips, and I enjoy the surprise of stumbling upon the unexpected. I know I’ve found something great when I start slipping it into a story. 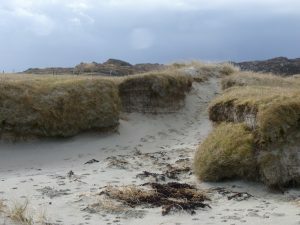 In the United Kingdom recently, against plans to do some serious location research in the Outer Hebrides for the next two books in my Crossing the Line series, I found myself researching another site for the novel that will come after the current series. Not planned at all! We were in Northumbria and my daughter expressed a desire to visit Hadrian’s Wall. 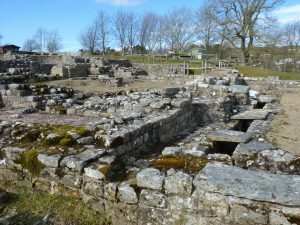 The Wall wasn’t on my research radar, but it seemed a good way to spend a sunny day so off we went ending up in Vindolanda. It wasn’t until we started stepping over the ruins of a succession of Roman Forts and I read the dates and backstory of the site that I realised it fitted neatly into a planned novel set in the Gallic Roman Empire in the 3rd century AD. Of course, the physical location wasn’t exactly right, but the building remains and layout of the forts and accompanying settlement can be translated from one country to another, and the dates were perfect. This future novel will also have links with England of the same time period so I started snapping and plotting and planning. Characters that hadn’t yet been thought of, started to ghost into my imagination. I could hear dogs barking, people trading goods, using the baths, soldiers marching, and commands being shouted. I can’t wait to write this story! Eager to find out more about the people that would have lived in these settlements, I hit the Visitor’s Centre and Accompanying gift store, and bought some books. Then went back outside to take more photos. About a week later, in Bath, I felt the same sense of excitement wandering around the famous Roman Baths. 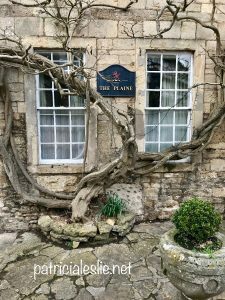 I then moved into current novel research mode when we randomly booked our accommodation for the night at The George Inn – a 16th century inn. The walls of our room were at least three feet thick, the heavy beams low, the doors, windows and fireplaces as rustic and genuine as I could hope for. It seems likely that Crossing the Line books one and two will include a lot of rain and a few blizzards. 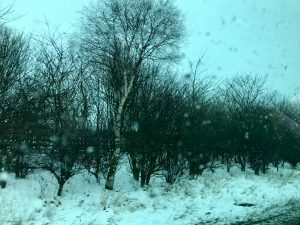 My first few days in England coincided with the tail-end of the “Beast from the East” and a very cold start to spring followed by days of pouring rain in the Outer Hebrides. When my characters travel through these areas they will be as cold and wet as I was (more so), without the benefit of a car with heated seats to escape to. 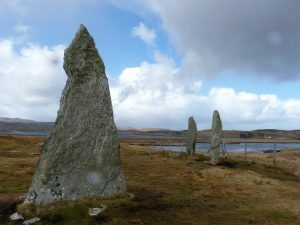 When they come across stone circles and black houses, they will be extensions of the very same ones that I came across on the Isle of Lewis. Callanish was very much a planned stop on my itinerary. Experiencing the environment and the outlying lochs and fields of peat and machair, not to mention the many sheep, was an interesting aside. The colours of a wet Hebridean landscape are surprisingly dramatic. The history of the people and islands, deep and rich. I took more photos. I bought more books. Glastonbury Tor may also make an appearance. Here’s another site I hadn’t planned on visiting, but noting it’s proximity on my road map as I drove north from Padstow in Cornwall, decided another side trip was in order. I arrived early in the morning with mist in the hills and valley, and few people (read tourists like me) about. With a darkening sky and rain imminent, I walked the path up to the Tor. A Christian monastery does not figure in Crossing the Line, but the site was important to the local people for centuries before Christianity. I don’t know how, but the Tor too may figure in the story. One of my characters is of Cornish background. That’s not too far away – I’m sure I can work it. The benefits of wandering is that it allows for a more fluid creative flow of ideas. Without the rigid structure of a detailed itinerary to stick to, the mind can stay relaxed and open to possibility. Besides that, I’m easily distracted by what may be around the corner or over the next hill. Patricia Leslie is an Australian author with a passion for combining history, fantasy, and action into stories that nudge at the boundaries of reality. Her latest novel is Keeper of the Way, published by Odyssey Books. Many thanks for visiting my blog today Patricia. You’re research has taken you to many of my favourite places in the UK.